I feel like doing a Free Fiction Friday today! YOU’RE WELCOME. This story, A True Story About the Devil and Jamie’s Shoes, was written for a Shock Totem flash fiction contest prompt and was first published in the delightful anthology The Old Weird South, edited by Tim Westover. I liked the feel of it so much that I included it in my short story collection Peculiar Situations, available on Amazon. I grew up in the mountains, and to get anywhere we had to go up and down and all around hills and mountains of various sizes. (In fact, my boys know the way to their gram and pap’s house as “Up the mountain and down the mountain”.) There’s one road in particular that takes a wicked curve at a wicked angle. It’s known locally as Peggy’s Curve and I was always admonished to drive carefully around that turn because PEOPLE HAVE DIED THERE. No one ever told us who died, and for our entire childhoods my sister and I thought it was some teenage girl, probably on her way home from prom, obviously called Peggy. I scared myself more times than I can count by imagining her ghost haunting that stretch of wooded road, appearing in front of the car while I was driving or, more often, showing up in the rear view mirror after I sped past. I never saw the ghost of the long lost Peggy girl, and here’s why. A few years ago my dad was telling stories of the area, and he finally — finally, after 30 years! — got around to telling us that Peggy’s curve was named after a truck driver who had been killed in a crash there. A man. Who had a peg leg. I suppose the ghost of old man Peg could haunt that curve, too, but I’m no longer quite so afraid of seeing a ghost there. I do, however, always drive very carefully around that curve. Because PEOPLE HAVE DIED THERE. One Saturday me and my brother Jeff and our pal Jamie were coming home from a day’s fishing. Our poles made shadows on the road and the laces on Jamie’s shoes were flapping, kicking up little puffs of dust. It being summer, Jamie was the only one wearing shoes. He never went barefoot, even though his mama tried to make him save them for school and church and threatened his life if he ever lost them. We asked what was wrong with squishing through mud and marsh like the rest of us, and he took off the shoes and showed us the paper that lined the insides. Turned out that Jamie was superstitious. Last year at the county fair an old woman told him to write the names of the Apostles on a piece of paper and put it inside his shoe for good luck. Now, Jamie is also sloppy, and couldn’t keep his shoes tied tight. He always had extra scraps of paper ready in his pockets, just in case the ones in his shoes fell out. We came up on the crossroads where Main Street runs out of town and all the way over to Durham and there was old Peg Barnes, leaning against the telephone pole. His wooden leg tapped against the crutch he used and his grizzled hair stood out all around his face. As we went past he grunted “This is it.” We stopped – how could we not, with an opening like that just hanging there? “This is what?” I asked. Jamie got a little pale. Jamie was listening with wide eyes and Jeff was too. “What kind of deal?” I asked. “Old Scratch needs someone,” Peg said, “to stoke the furnaces away down in Hell. That’s what he wanted: two men, to do his bidding. I told him I’d bring him his men, sure, right here to this crossroads. And here we are. I figure a boy’s as good as a man, to the devil.” He looked over at Jeff and winked. My brother started to cry. The wind kicked up and the sky got dark. We blinked the dust from our eyes and when we could see, there was a man. I tell you, the devil didn’t look like much. I’ve seen finer men, but he wasn’t shabby, and I’ve seen uglier men, but he wasn’t handsome. He looked like every other fellow on the street. I could tell he was the devil, though. It was all around him. “Never mind that. I’ve got what you asked for,” Peg said. “Boys, not men,” said Mister Scratch, studying us. Scratch gave him a look but waved his hands. Peg dropped his crutch and the peg fell off as his leg filled out. Peg stared down at his two good legs, then took a few steps and whooped. He ran in a circle, laughing. First I thought “Thank the Lord” because it wasn’t me or Jeff. Then I thought “Poor Jamie,” and then I thought “Good” because the devil had also chosen Peg. Peg stopped running the moment the devil’s finger tagged him. He gave a raucous laugh and, with a whoosh of dust and the rush of hundreds of wings, turned into a giant crow that picked up Peg in one claw and Jamie in the other and lifted off. Now this is where Jamie’s shoes saved the day. As the devil flew into the air, Jamie’s shoelaces wrapped around the telephone wire that hung over the crossroads. The laces tangled and caught, and there was Jamie, hanging from the devil’s own claws, stuck on the wire. The devil glared back, but no matter how he flapped and pulled, Jamie wasn’t going anywhere. It didn’t make sense, how he stayed in those floppy shoes. The only thing we could think later was that those Apostles’ names held him fast somehow. He wasn’t coming out of those shoes, though, and those shoes weren’t coming off of that wire. Scratch thought for a moment and then flew under the wire, giving the laces some slack, hoping they’d come unstuck and let him carry away his prey. He shook Jamie a little and a scrap of paper came floating out of Jamie’s pocket. It hit the devil square between his eyes. Scratch squealed, shaking his head to get it off, but it was stuck fast. Jamie wiggled a bit and another scrap came down, and then it was snowing paper, a white blizzard of Apostles’ names swirling out of Jamie’s pants. You know how sometimes you’re so scared you come out the other side where it hits you as funny and you laugh because there’s nothing else for it? That’s what happened to us when Jamie’s scraps kept falling. So there’s the devil, and there’s Jamie, stuck, and there were Jeff and me, laughing. The devil hates being laughed at, and those papers must have hurt him something bad. Faced with that, Mister Scratch must have decided that one man was good enough. He gave up on Jamie and left, Peg still hanging from the other claw. The papers stopped falling as soon as the devil let go and Jamie dropped, barefoot, to the ground. No matter how we tried, we never could get those shoes off the wires. Jamie got a hiding when his mama found he’d lost them, though, even if it saved his life. You can laugh at the devil but there’s not much you can do about mothers when it comes to shoes. Attention all bird lovers! 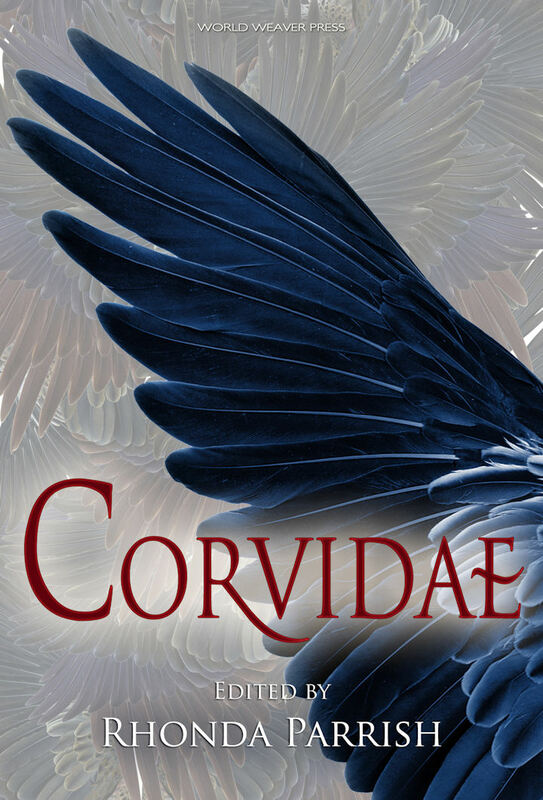 Corvidae is now available! I’m excited about this anthology for a lot of reasons: I love Rhonda and am happy to be in one of her anthologies, I love Jane Yolen and am thrilled to have my name in the same TOC as hers, and I love birds in stories just in general. But one of the biggest reasons I’m excited about this anthology is because this is the first Zinnia and Harris story to appear in print. Sometimes you have ideas that seem great at the time and then, upon further reflection, you realize they’re terrible and you put them safely away. Sometimes you have ideas that grab you right from the start and then, upon further reflection, grab you even more. That was Zinnia and Harris. I knew I wanted to write about some buddies. I knew I wanted to write about women. I knew I wanted to write about monster hunters. So I did those things. “Seven for a Secret,” the story that appears in Corvidae, is the first to be published but never fear, there are a half dozen more stories in various stages of completeness, so I hope to have more to share soon. For now, though, you can check out Zinnia and Harris in “Seven for a Secret” (and many, many other amazing stories by other amazing authors) in Corvidae, available directly from the publisher here, or on Amazon here. It’s also on Goodreads so if you read it please stop by and give us a review!